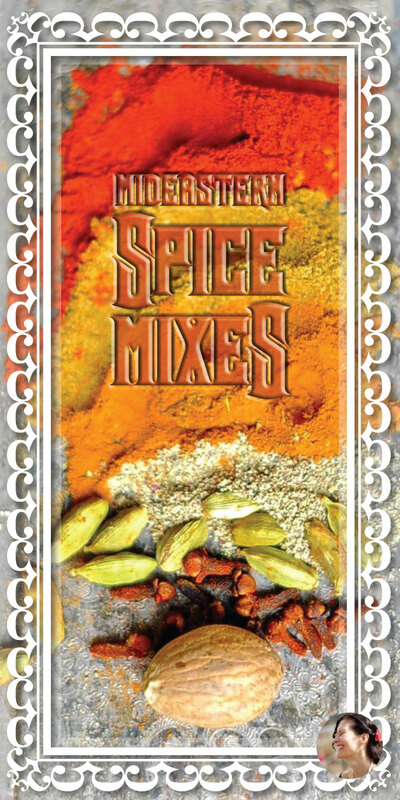 Spice mixes are like folk songs. It is rare to find two identical versions. That is the fluid nature of music and food. Ask two Yemenite grandmothers for their Hawaij recipe and you will probably get 2 different but equally delicious recipes. 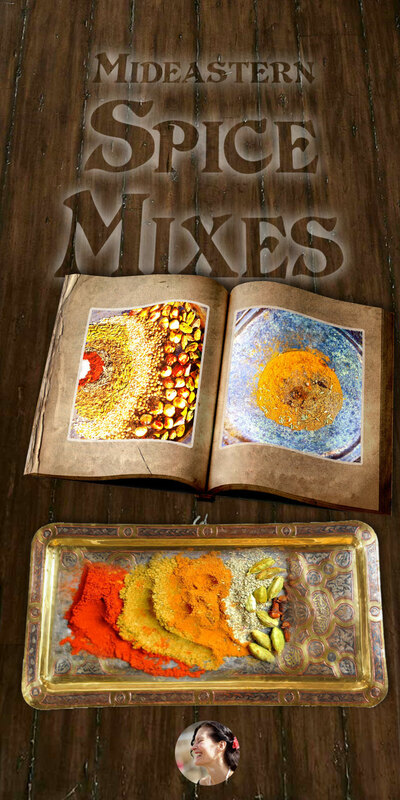 Instead of reaching for 5-6 different spices and herbs to flavor your meals, prepare, in advance, a few well balanced mixes. I guarantee it will save you time and improve the flavour of your go-to dishes. 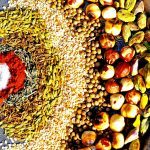 Sprinkle Dukkah over your rice or stuffed peppers, coat your tofu or roasting potatoes with smokey Baharat (Shawarma) spices or sauté onions in Hawaij before adding them to veggie soup. 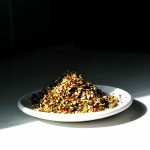 Keep Dukkah and Za’atar on the table with the salt and pepper to sprinkle as you see fit. Hours earlier we had arrived, descending the winding, cracked asphalt road that leads through the Negev dessert to the edge of the crater, switchbacking to the bottom. Sunlight glinted morse signals from the wrecked cars that had met disaster on their way down the steep incline. Our poor car bumped across dirt tracks, that had more ruts than road, as we stared distractedly at the terra-cotta hills and lavender shadows between. The setting sun splashed the sky and illuminated copper the distant, sheer walls of the makhtesh* that surrounded us. We wandered the Nabatean ruins of the Spice route, sitting in stone rooms long forsaken. Dry winds carried the sweet fragrance of desert Broom (Rotem) blooming in nodding sprays of white from the green wadis. Night fell like a turbulence of blue roses. Arriving at the empty camp site I remained behind to guard our stuff while my husband Hanaan and my son Aylam ambled off (with the flashlight) to tell the Bedouin grounds keeper that we were staying the night. There I sat on the stony ground, in darkness thick as molasses, listening to the jackals, knowing it would take 3 cups of tea, until the boys returned to me. Return they did. After a smokey meal we spread out on our sleeping bags by the fading sparks of the fire. The stars drooped like low hanging fruit just out of reach and whirled their slow glowing dance against the black. We searched for the basic constellations, murmuring and yawning, falling in and out of sleep. Long after the fire died, after the desert foxes had rummaged through our camp and made us giggle, after the moon rose and the boy and I were firmly asleep, I was woken by Hanaan’s whisper. You-You alone will have stars as no one else has them… In one of the stars I shall be living. In one of them I shall be laughing. And so it will be as if all the stars will be laughing when you look at the sky at night..You, only you, will have stars that can laugh! 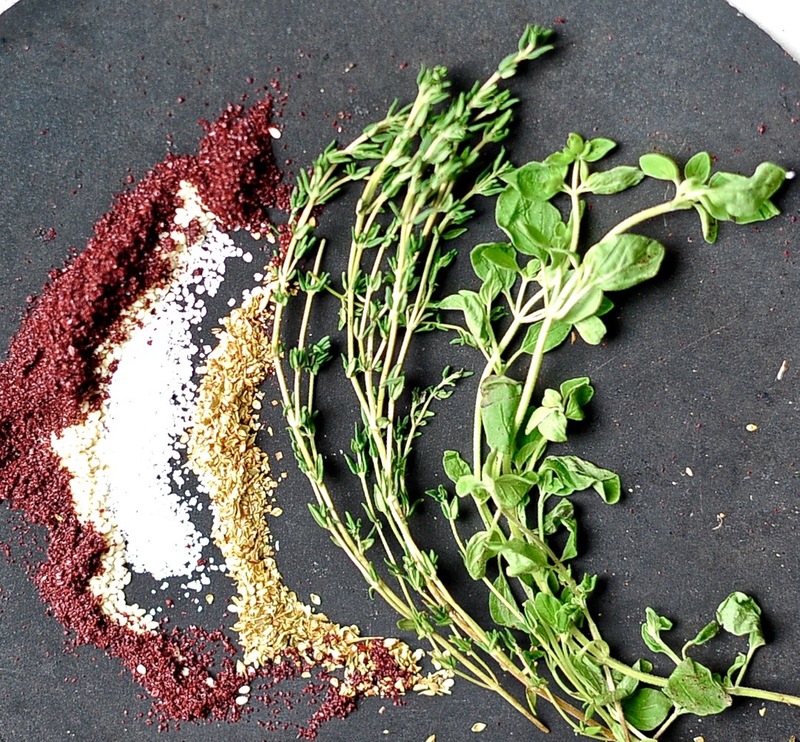 Za'atar is both an herb (hyssop) and a condiment that is used across the middle east. People dip their pita in it, throw it on their grilled veggies and sprinkle it on their labneh. Mince your herbs if using fresh. Mix all the the listed ingredients together. An Egyptian condiment that is frankly addictive. I find myself grabbing the odd pinch during the day just to awaken my taste buds. As with all condiment you'll find many variations. I adore the mix of pistachios and hazel nuts but feel free to mix it up. Roasted peanuts are another great variation. Toast all of your seeds (except sesame) in a heavy bottomed skillet over medium heat, shaking the pan frequently, until fragrant. Remove from heat. I toast my sesame seeds separately because they just seem to want to burn the second I'm not paying attention. Once everything is toasted and has cooled. 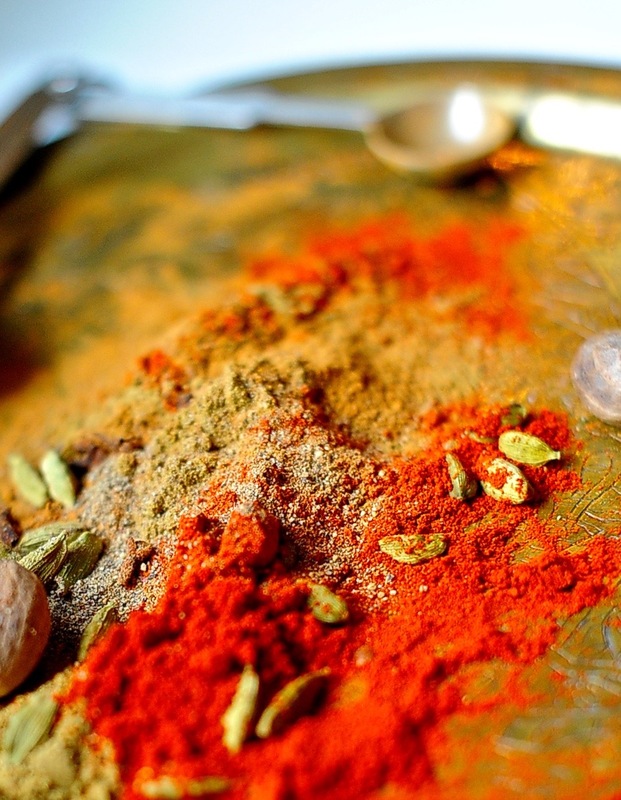 Place all the ingredients in your food processor and grind to a coarse meal or pound away with a mortar and pestle. When you are done you want to still be able to see some color and texture variations not a pile of dust. Place in an air tight container and store in a dry place. 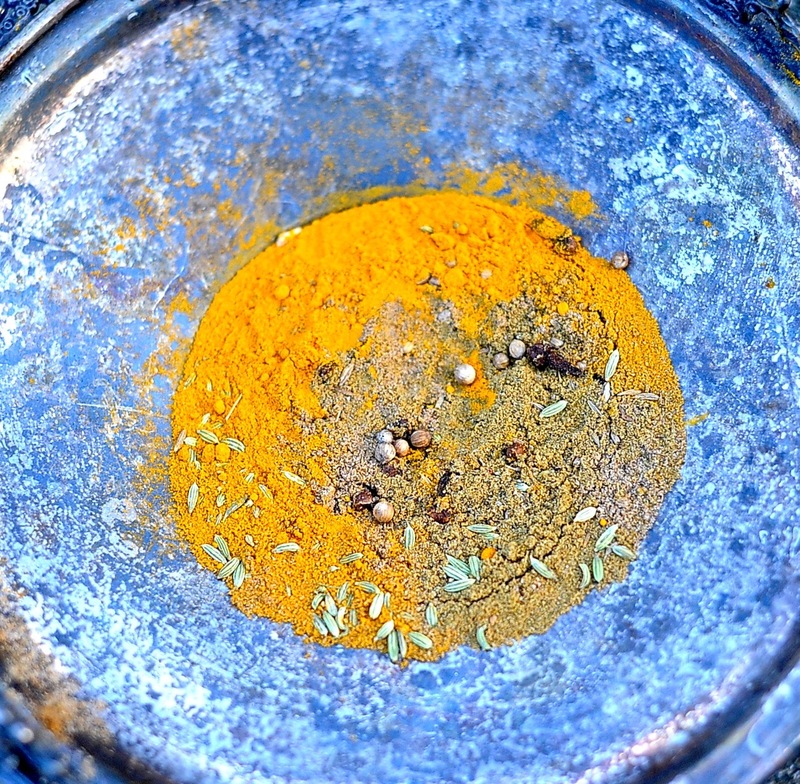 There are two Yemenite spice mixtures with the name Hawaij. One is used for coffee and the other is used in savory cooking and soups. I am giving you the latter. It is a tantalizing mixture of cloves, nutmeg, ginger, and whole seeds. 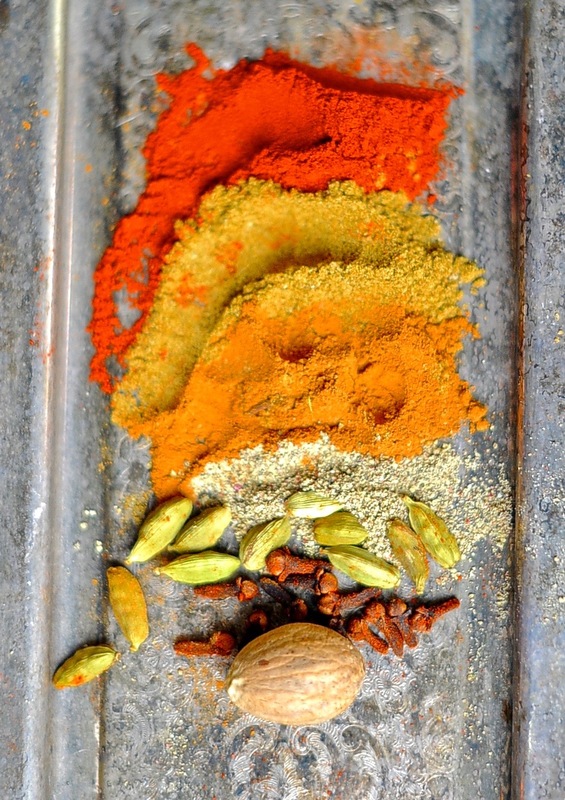 Toast your whole spices, coriander, cumin and cardamom in a heavy bottomed skillet over medium heat until fragrant. Remove from heat and allow to cool. Grind all of your ingredients including the toasted ones in a spice or well cleaned coffee grinder. Grind all of your ingredients including the toasted ones in a spice or well cleaned coffee grinder. 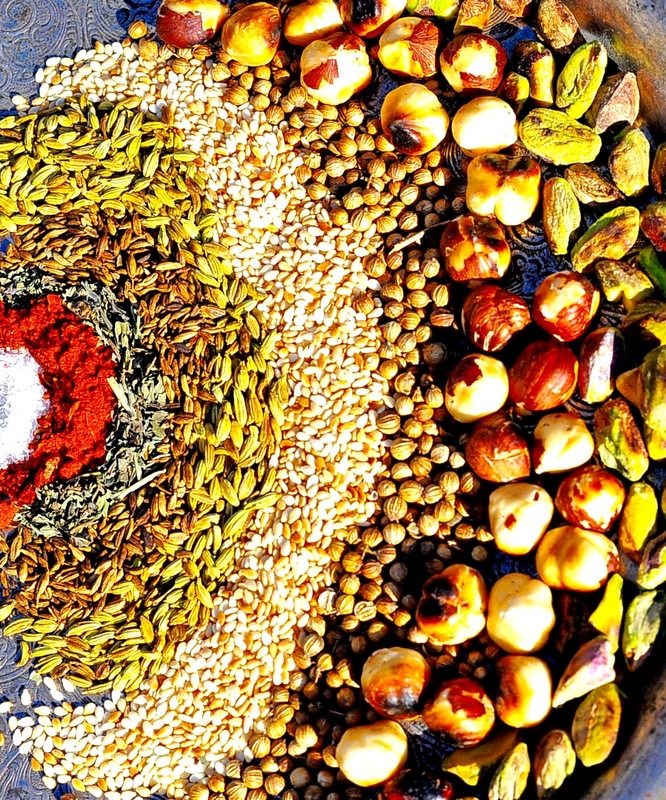 Just as Sahara means desert, Baharat means spices in arabic. Toss some chickpeas in olive oil and a tablespoon of Baharat and roast up a crunchy additive snack or sprinkle it over your already baked sweet potato. OMG! 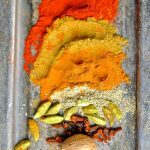 Mix all of the ingredients together and store in an airtight container. *The Ramon Crater in Israel’s Negev dessert is the world’s largest erosion crater, or makhtesh. A landform unique to Israel’s Negev and Egypt’s Sinai deserts’, a makhtesh is a large erosion cirque, created 220 million years ago when oceans covered the area (the word crater is therefore a misleading translation of Hebrew to English.) The Ramon Crater measures 40km in length and between 2 and 10km in width, shaped like a long heart, and forms Israel’s largest national park, the Ramon Nature Reserve. oh Alison that means so much. Thank you. A Lebanese friend of mine once gave me a jarful from the bag of spice mix that she’d brought back here after her last visit to her family. I would put my nose into it the jar and inhale the dusty fragrance of rocky Mediterranean hillsides. I imagine that for her the aroma was even more redolent of home and childhood and far-away loved ones; she was generous to have given me so much of her precious stock. As the contents of my jar dropped, I used it more and more sparingly until finally it was gone. 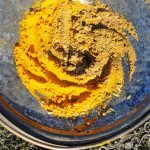 Looking at the spice mix recipes you’ve offered here, I realize it must have been something like za’atar that my friend gave me. If I can find sumac I’ll whip up a batch and give her a big jarful. Flaxen sister. No need to whip up anything. I sent you a package last week that contains a jar each of Za’atar, Hawaii, Baharat, and Dukkah. We had a small dinner party last weekend and I used the za’atar to flavor the roasted potatoes and also sprinkled it on the Greek-style white beans. The perfect final touch to both. Ah – yes! @ I made roasted potatoes with that too. Even I could not mess it up. Was delicious. Lucky guests having you cook for them. A cheat of sorts, a bag of pixie dust. One sprinkle brings food to life. You be Vianne, I’ll be Anouk, but of spices not of sweets. We always did prefer the savory. rabbit, Pantoufle .Don’t come home until you have found your shadow.